I play a great deal of bluegrass music, but I also play some jazz, blues, country, Irish, classical, etc., as well. My harmonica is essentially a fiddle with reeds, instead of strings and a bow. I have been playing fiddle-style harmonica for 25 years or so and am interested in sharing information with other players with similar interests. I am a member of the International Bluegrass Music Association (IBMA), the Central Texas Bluegrass Association (CTBA), the Bay Area Bluegrass Association (BABA), and the Society for the Preservation and Advancement of the Harmonica (SPAH). I am one of the songwriters of American Heritage, and I currently play for RedEye, Manchaca All-stars, and the Blazing Bows. I also occasionally play for the Ledbetters, the High Stakes Rollers, Wyldwood, and anyone else who desires my harmonica talents, my vocal harmony talents, or who needs a mandolin player, a guitar player, or an upright bass player. The High Stakes Rollers, a skilled and talented bluegrass variety group based in Austin, Tx., have produced a new CD of their live performances. On that CD, I was honored with an appearance playing harmonica on the swing/bluegrass tune "Little Rock Getaway". To get your own CD for $10, email Cara Cooke or Eddie Collins. The music world has lost a harmonica legend. Lonnie Glosson (93), known as the "talkin' harmonica man", died of congestive heart failure Friday, March 2, 2001, in Arkansas. From the 1920's to the 1950's he traveled the country playing the harmonica in shows and on the radio, including a bit on WLS Radio (Chicago) and the Grand Ol' Opry. He later even found himself on the 1970's television show, "Hee Haw". With his harmonica playing partner, Wayne Raney, he wrote the song, "Why Don't You Haul Off and Love Me." Lonnie's composition "Matthew 24" has been recorded by both Kitty Wells and George Jones. Lonnie: We are going to miss you. Camp Bluegrass & Swing Camp are done for this year. But they are getting ready for the next one!! Camp Bluegrass (with Bill Keith, Alan Munde, Wayne Shrubsall, Roland White, Adam Granger, Steve Kaufman, and more) and Swing Camp (with Slim Richey) were a blast. They were held on the South Plains College campus during the same week. The dorm (for the first time in Camp Bluegrass history) was completely full -- with a waiting list in case someone could not make it at the last minute. This year the student body included 9 "kids" who ranged in age from 8 to 18. Their progress and ability was impressive. 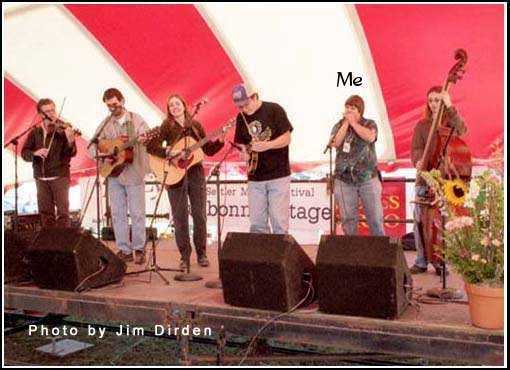 For the student concert, they formed a hot-shot 9 member bluegrass band called, "Under the Legal Limit". The harmonica was represented in different fashions during that same concert as the students who also played harmonica decided to do something in the student concert as well. Overall everyone had fun. They will update their Camp Bluegrass site soon with pictures of this years camps and information on next years camps. Please check the site to see what is coming up. Remember, with instruction, room, and board totaling less than $500, you can take an economical vacation for a week and learn about your favorite music or instrument at the same time! They are worth the trip! Try them out! Two Harmonica studded benefits in Austin, Tx. The Austin chapter of the Harmonica Organization of Texas (HOOT) will be throwing two benefits soon. September 27th -- 7 pm. -- the 1st anniversary of the Austin chapter of HOOT and a benefit for Big Brothers/Big Sisters -- La Zona Rosa, 4th St. and Nueces(downtown) -- the line-up includes Gary Primich, Gary Forsythe, Ted Roddy, Michael Rubin, Walter Daniels, Michael D'Eath, and me and the Manchaca AllStars (8:40pm.). Fall Bluegrass Festival in Round Rock! The Central Texas Bluegrass Association will be throwing its Annual Fall Bluegrass Festival on Oct. 5-6 at Old Settlers' Park (near the Dell Diamond). The headliners include the Reno Brothers and Alan Munde and Joe Carr (Country Gazette, Camp Bluegrass, and South Plains College). Many talented Texas bands will fill out the rest of the line-up. There should be at least two harmonica players performing in the line-up: Don Hayes (LoneStar Bluegrass) and me (the Ledbetters and the Manchaca AllStars). ==>For directions and more information on the festival and its line-up, check the festival webpage. The Manchaca AllStars are at their home venue (the Manchaca Firehall) every 2nd Friday of the month: 7:30 pm.-10:30 pm. (when the cows go home). We take requests - especially if they are for a harmonica tune! The Manchaca AllStars will be playing at Artz on Sunday, October 14, 2001 -- 6pm. The High Stakes Rollers play Artz Ribhouse (Austin, Tx.) every 4th Sunday evening (after the weekly bluegrass jam). Old Settler's Music Festival -- beginning to gear up for next year's festival. Keep your eyes peeled for the next bluegrass harmonica workshop at the festival! Camp Bluegrass/Swing -- South Plains College, Levelland, Tx. -- Spend a week for a reasonable price learning from the professionals about your favorite music and how to play it.